We stood for our Lord and Jesus was and is the Victor! It is estimated that this legislation could save upwards of 20,000 unborn lives each year in Texas! This tremendous victory is in no small part due to all of your prayers, calls, emails and pilgrimages to Austin. Thanks to a very generous donor, the Catholic Pro-Life Committee was able to organize four buses to Austin to transport nearly two hundred people to #stand4life in person at the Capitol just last week, joined by thousands of fellow pro-lifers from the Dallas area and throughout the state. [The] yelling and screaming and shrieking went on from before the Senate began at 2:30 in the afternoon until after they called the vote at before midnight. We could hear the screaming in the Senate Gallery but it was much more intense outside in the hallways of the rotunda. The later it got the more frenzied it got. . . . [it] reminded me of what Elijah must have witnessed when he challenged the priests of Baal on Mt. Carmel. When their prayers seemed to go unanswered they started getting louder and louder, and yelling and chanting and working themselves into a frenzy hoping they would invoke their god into action. . . . . Then when Elijah prayed to God, God immediately answered and showed his might. That is what happened on Friday at the State Capitol. So many pro-life witnesses stood courageous in the midst of this very real clash against the revilement and verbal buffets of those who opposed life. It was an incredible inspiration. Together, we stood for Our Lord and Jesus was and is the Victor! And thankfully, our brave legislators and capitol security were ready to deal with any threats to the peace to ensure the democratic process proceeded. Please take a moment to contact your state senator and state representative and thank them if they voted in favor of life, as well as the Governor and Lt. Governor for their devoted support of this process. A record of the House and Senate vote as well as links to contact information can be found below. Of course none of this would have been possible without the palpable presence of Our Lord and His Blessed Mother, whose color blue was worn in the name of life throughout the Capitol the past three weeks. Tomorrow ends the Novena to Our Lady of Mount Carmel on her feast day – this epic victory was won in the middle of that novena! Please join us in prayers of thanks for Her intercession and the protection and healing assured by Her Son's great sacrifice for us all – including those who misguidedly fought against this monumental victory. so we can be sure to include them in our online #stand4life album. Also stay tuned for an upcoming documentary, "Here", about this historic moment in Texas legislative history. The CPLC was blessed to be a voice for life in not only this documentary but also in several news stories by various media outlets, in both English and Spanish. While we celebrate this historic victory for life and Our Lord, we must remain steadfast in the fight that lies ahead. Abortion advocates have already publicly promised to fight every facet of this law in the courts, maybe all the way to the U.S. Supreme Court. We must remain vigilantly prayerful that this law will be sustained and enforced in its entirety. Thank you for your continued support of this effort on behalf of the precious unborn, and for all you do! It is an honor to Stand4Life with all of you! P.S. Please don't forget to thank your state senator and state representative (contact here) who supported HB 2, as well as Governor Rick Perry (contact here) and Lt. 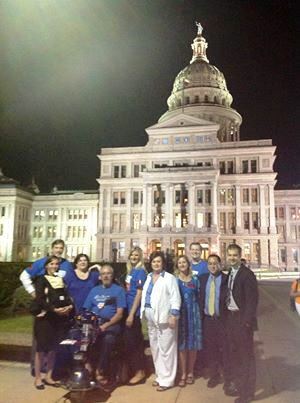 Governor David Dewhurst (contact here) for their #stand4life. A record of the legislators who voted for HB 2 is below.